Social media in the new Web 2.0 world has proven to be an effective new marketing tool but one that also creates some interesting privacy challenges. This presentation will give practical tips on how to avoid privacy pitfalls as you create social communities for your customers and deliver marketing messages and apps into existing social networks like Facebook, Linked In and Twitter. 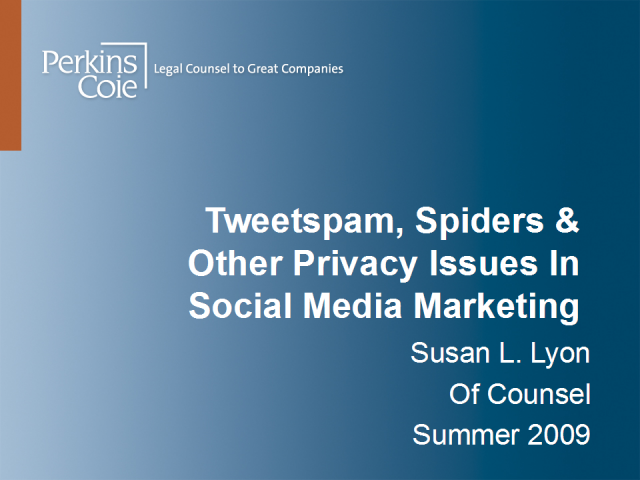 Susan Lyon is a privacy expert with a wealth of experience advising clients on emerging social media issues. As Of Counsel for Perkins Coie's Privacy and Data Security group, she has counseled companies from small startups to major name brand retailers, social networking sites, mobile service providers, network advertisers, and a wide variety of tech companies.